Beaver trapping was the traditional method to resolve beaver conflicts. Unfortunately though it is usually a short term solution to beaver problems because new beavers often soon relocate to the trapped area. It is most useful when flow devices are not feasible. In our experience trapping is necessary for approximately 25% of beaver-human conflicts. Most issues are better controlled with nonlethal methods. 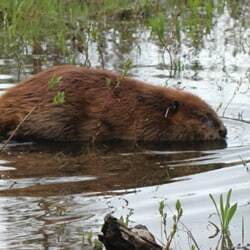 In an area with a healthy beaver population beaver removal typically needs to be repeated every year or two because new beavers will be attracted to the habitat. 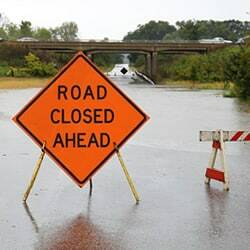 Therefore wherever feasible we recommend flow management devices (pond leveler pipes or culvert protective fences) because they are the most long-term and cost-effective solutions to beaver flooding problems. 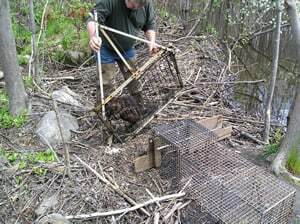 In Massachusetts, a regulated beaver trapping season starts November 1st and ends April 15th. In MA and many other states trapped beavers cannot be relocated, they must be killed. Out-of-season MA trapping can occur if there is a threat to human health, safety, or property. then the local Board of Health can issue a beaver removal permit. In MA this permit is necessary to use a lethal Conibear trap at any time of the year. If you are interested in becoming a licensed trapper contact your State Wildlife Agency for additional information. In MA visit the Massachusetts Division of Fisheries and Wildlife website. If a pond level is dropped two feet or more, beavers may build a new problematic downstream dam. Where this is likely it may be necessary to first trap the beavers accustomed to the high water level and then install a flow management device. When new beavers relocate to the area, they will not have a memory of higher water and are more likely to tolerate the smaller pond without new dam building. If a flow device failed for some reason, the beavers may need to be trapped so repairs can be made. A “No Tolerance Zone” for beavers is a place where significant harm to human health, property, or safety would occur with any beaver damming. The topography or development of an area presents so many potential conflicts if beavers are permitted stay, it would be cost-prohibitive to “beaver-proof” with flow devices.